In April 2013 at the ACRL Conference in Indianapolis, IN, Char Booth, Lia Friedman, Adrienne Lai, and Alice Whiteside presented a panel entitled, “Love your library: Building goodwill from the inside out and the outside in” in which they highlighted examples of non-traditional marketing in academic libraries at Claremont, the University of California San Diego, Mount Holyoke, and North Carolina State University. The panelists freely encouraged audience members to recreate and adapt the ideas at other institutions, saying “Here is something that worked for us. Maybe it will work for you!” One of the ideas Alice shared was a food-themed citation help event she developed with colleagues Chrissa Godbout and Kathleen Norton at Mount Holyoke. John Jackson recreated the event at Whittier College a year later. From opposite coasts, we’ve joined forces here to discuss the development of the ExCITING Food workshop, its reiterations, and the importance of sharing ideas among academic library communities. Borrowing each others’ ideas is common in our field, and the “Love your library” panel celebrated and encouraged this practice. When we “steal” each other’s trade secrets (with proper credit, of course), everyone benefits. The advantages of “open-sourcing” instructional programming is probably obvious to readers of TechConnect. The information literacy needs of most undergraduates, especially first-year students, are roughly the same in that they come to college with little to no experience with scholarly communication practices, limited knowledge of the breadth of information resources, and feel overwhelmed by the complex requirements (i.e. format, tone, structure, citations) of their assignments. Even accounting for the idiosyncrasies of each institution, librarians can quickly adapt events that were successful at other libraries to their own unique communities, saving time, reducing the stress of preparation, and ultimately fulfilling a recognized information need for their users by sharing successful attempts at “sneaky teaching” with the professional community at large. In our experience, everyone benefits more if the first round of sharing isn’t the end of it. We have many methods and modes of learning about “stealable” ideas: professional literature, conference presentations, the Web, and word of mouth. Databases like PRIMO and LOEX Instructional Resources, personal blogs, Slideshare, and LibGuides all facilitate this type of sharing. More rare is the ability to provide public feedback on how one programming event succeeded or failed in a different context and how it was adapted. How can we more actively create an open-source mindset around instructional development? We hope this post is a step in that direction. Alice: At Mount Holyoke College, we hatched the idea for ExCITING Food when the Dean of Students Office asked if the library could provide a workshop on citing sources during fall 2012 orientation. The planning group consisted of myself, Chrissa Godbout, Kathleen Norton, and our MLS intern Lilly Sundell-Thomas. We felt strongly that orientation, when new students are concerned with getting their bearings, meeting new friends, and struggling to stay afloat of the information overload, was the wrong time to discuss the ethical use of resources in their future research papers. That said, we appreciated that the Dean of Students Office turned to the library with this request, and we began to think about other ways to address this clearly identified need. Historically we haven’t had great success with drop-in workshops in the library, and we knew we wanted to try something different. Our goal was to help students understand the why, when, and how of citing sources. For the greatest impact, we wanted to reach them at the point in the semester when they were thinking about their bibliographies. We hoped our “not-a-workshop” would be informative but also low-threshold and engaging. At Mount Holyoke, the surest path to engaging students usually involves food, and thus the brainstorming began. When we pitched the idea to our department head, he was skeptical: a fun drop-in citation help event? Persuaded by our enthusiasm, he fortunately agreed to support our modest budget of $50 for food. As we figured out the details, we ran the idea by our student workers and reached out to the Speaking, Arguing, and Writing (SAW) Center. The SAW Center agreed to join the effort, helping to advertise and staff the event. 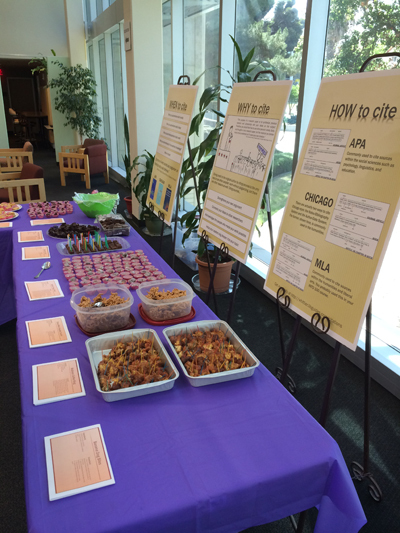 One of the central ideas for ExCITING Food is citing the recipes for each snack provided; we used the snacks themselves to illustrate different citation styles, and we selected snacks to showcase a range of recipe sources (book, website, archival material, etc.). Mount Holyoke College has a strong sense of its own history, and everyone on campus knows about Mary Lyon, the school’s founder, and her vision for women’s education. The Archives have a few recipes written out in her own hand, including one for gingerbread, a variation on her molasses cake. This was a clear winner for ExCITING Food. M. Lyon, ca. 1845, Molasses Cake with Plums, unpublished manuscript, Mount Holyoke College Archives and Special Collections, South Hadley, MA. After that, we got a little carried away with picking snacks that had a connection to MHC: the infamous “Chef Jeff” cookies from Dining Services, caramel corn with an image from the Archives of students shucking corn ca. 1917. We even wrote to the President’s office asking for a recipe; she graciously replied but misunderstood our intention, sending a favorite recipe for a hearty stew. Instead of stew, we went with a recipe from the library director for mulled cider (C. Patriquin, personal communication, Nov 16, 2012). We chose to host ExCITING Food two weeks before exams, when many students were in the thick of working on final papers. We promoted the event via social media, posters, and personal emails to First Year Seminar faculty asking them to encourage their students to attend; SAW Center writing mentors, who are current students, distributed flyers and helped spread the word. Late in the afternoon on a Wednesday, we set up tables in the library atrium, a high traffic area in front of the main entrance, and wheeled out piles of handouts, platters of cookies, and crock pots full of mulled cider on book trucks. Our handouts included sample bibliographies (with the snack recipes) in different citation styles, RefWorks information, and DIY stickers (printed on mailing labels) with friendly URLs for the library’s Citing Guide and the SAW Center. Six librarians and two SAW Center writing mentors staffed the event, distributing snacks and handouts and answering questions. Through the combination of thoughtful timing, delicious food, and a bit of silliness, we pulled off an extremely successful session. In one hour, we distributed handouts, snacks, and our elevator pitch to over a hundred students, provided 21 citation consultations, and received abundant positive feedback from students and from our partners in SAW. John: Impressed by the creativity and accessibility of the outreach events presented during Alice’s ACRL 2013 session, I have since tried to reproduce many of the events in spirit if not in detail. 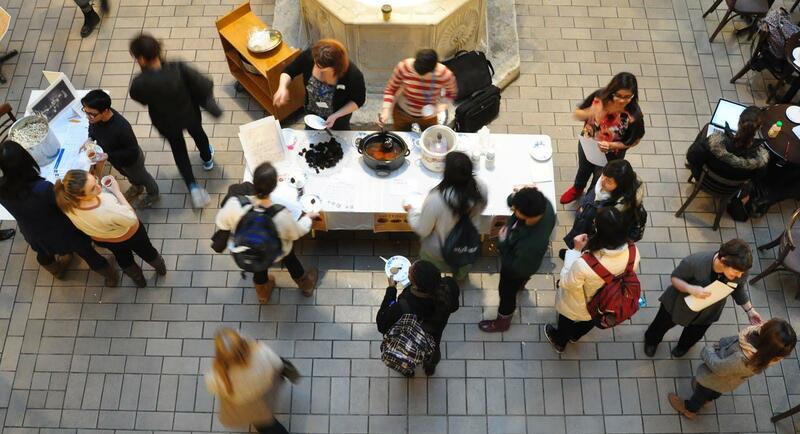 In April 2014, Wardman Library hosted its iteration of the exCITING Food workshop in the week leading up to finals. The day before finals began was thought to be the best time as students were beginning to think about the requirements of their final projects but not yet overwhelmed by details and deadlines. We promoted the event on the faculty and student email lists, our social media pages, via flyers and posters, and additionally contacted faculty who we knew had assigned bibliographies as final projects. We know that students and faculty struggle to manage the incredible amount of email they receive daily and so it was important to send frequent reminders via our (less intrusive) social media and to speak with teaching faculty directly about our plans, especially ways in which students could benefit from the information presented in our posters and handouts. One of my primary goals for the event was to highlight the helpfulness and creativity of library staff. Accordingly, I asked each staff member to contribute a dish to the event. This was perhaps the greatest source of anxiety for me: acquiring staff buy-in to make and bring enough food to make the event successful. Wardman Library is staffed by 13 employees, many of whom are extremely busy during the final weeks of the semester (especially our circulation and media staff). I was hesitant to ask my colleagues to take time outside of work to locate an appropriate recipe (we needed to have enough variety in the sources) and make it on the designate day. However, my colleagues were incredibly supportive and we produced enough food to push the scheduled 2-hour event into a 4-hour one. Originally, we planned to host the event outside the library in order to capture the portion of our student population that does not frequent the library on a regular basis, but coincidentally (and to our benefit) the southern California heat forced us to hold the event indoors. Instead, we held the workshop inside the library near an area that we thought would be unobtrusive and wouldn’t interfere with students trying to study for finals. To our surprise, the students were reluctant to approach the event, thinking it was invitation or RSVP only. So we waited for an appropriate moment and moved the event to a more central location, near the main stairwell between the library entrance and access to the bookstacks, one of the most heavily trafficked areas of the library. This turned out to immediately increase the number of students that approached the tables unreservedly. 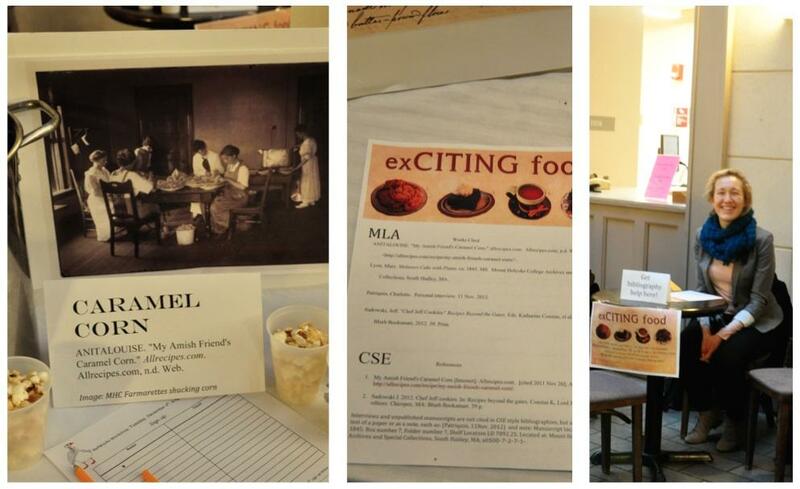 At the event, we provided a number of dishes including a brownies recipe from Katharine Hepburn, cornbread from a late nineteenth century college cookbook, and cookies made from various websites to illustrate citing a material that lacks an author or publishing date. Henderson, H. (2003, July 6). Straight Talk From Miss Hepburn: Plus the Actress’s Own Brownie Recipe. New York Times, p. CY9. New York, N.Y., United States. Clayton, H. J. (1883). Clayton’s Quaker cook-book: being a practical treatise on the culinary art. San Francisco: Women’s Co-operative Printing Office. Easy OREO Truffles. (n.d.). Allrecipes.com. Retrieved April 25, 2014, from http://allrecipes.com/Recipe/Easy-OREO-Truffles/Detail.aspx. In addition to the food, we provided two-sided half-sheet handouts that contained the recipe for each dish on one side and how to cite it in MLA, APA, and Chicago style formats on the other side. We also created three 20 in. x 30 in. posters outlining the when, why, and how of citations and placed these behind the food table. We made sure at least one librarian and one additional staff member were present at the table at all times and encouraged all library staff to stop by during the event to meet and talk with students. At the ACRL conference presentation, the panelists introduced the idea of “camogogy”: the combination of pedagogy and camouflage, or “sneaky teaching.” Ultimately, this was the spirit I endeavored to recreate at our iteration of the event and even went so far as to downplay the educational aspect of the workshop. Most surprising to me, however, was how little camouflage or “sneakiness” was required. The students loved the idea of citing recipes and seemed genuinely excited at the prospect of improving their own citations. A number of students returned later to ask specific questions about citing sources and, most importantly to me, identified librarians as being a resource for finalizing their bibliographies. 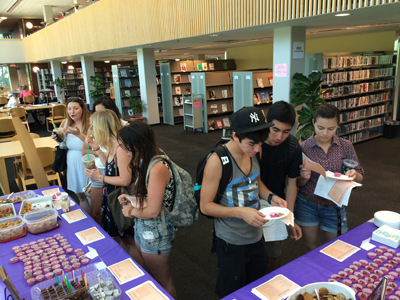 Alice: At Mount Holyoke, this event is on its way to becoming a library tradition. In November 2013 we hosted ExCITING Snacks, with essentially the same components as the first iteration and equal success. Our major change in the second year was that we simplified our snacks: just popcorn instead of caramel corn, cold cider instead of mulled cider. We also refined our publicity approach and were thrilled to get assistance from the Academic Deans Office, which sent an email blast to all first years, sophomores, and juniors about the event. Looking ahead, our favorite question is “Who else can we collaborate with?” While ExCITING Food is a fun event, the instructional component is very clear, and I think that has helped us find allies. Learning about the details of Whittier College’s implementation of ExCITING Food has also helped us rethink our approach and consider new elements. Next time, we will definitely create large posters to help students identify at a glance what the event is about. While we haven’t yet explored taking ExCITING Food out of the library, this is now on our list as we brainstorm new ways to collaborate with offices across campus. John: The success of our first attempt at the ExCITING Food workshop and the enthusiasm it generated among the faculty at Whittier College has all but guaranteed that we will attempt it again next year. However, there are certainly improvements to be made. For instance, we would like to be able to capture a “non-library” audience, students who do not regularly visit the library, and may consider moving the event to a more central location on campus. This could potentially open up opportunities for new collaborations with, say, catering services (if we decided to host the workshop near the student cafeteria) or the Center for Advising and Academic Success (if we wanted to host the workshop near the tutoring center). Additionally, we would like to find a way to involve faculty and student peer mentors, not only in promoting the event, but also in providing on-site help with creating citation (or even providing additional food!). Talking about how we adapted an idea in this forum is the first step. What other ways can we publish, adapt, and improve instruction content as a community? Between 2006 and 2008, the Oregon Library Association’s Library Instruction Roundtable maintained a Library Instruction Wiki (since expired). Some academic faculty are using GitHub to post their class syllabus for other teachers to modify, fork, and utilize version control. Public librarians like Ben Bizzle of the Craighead County Jonesboro Public Library use Dropbox to share marketing content with other librarians. And who among us has not used Google Drive to collaborate? The tools for open-source development of instruction material exist: we simply need to make a concerted effort to develop this content on a large scale. Alice Whiteside is a Librarian & Instructional Technology Consultant at Mount Holyoke College. An active member of the Art Libraries Society of North America (ARLIS/NA), she currently serves as chair of the Professional Development Committee-Education Subcommittee. Alice holds an MSLS from the University of North Carolina at Chapel Hill and a BA in Art History from Bard College. John Jackson is the Reference & Instruction Librarian at the Wardman Library of Whittier College, a private liberal arts college outside Los Angeles. John holds an MLIS from San Jose State University and an MA in Medieval Studies from the University of Virginia.